USDA Secretary Tom Vilsack announced this afternoon that the agency will fully deregulate Monsanto’s controversial genetically engineered alfalfa. The choice was favored by the biotech industry and one of three options identified in the USDA’s Final Environmental Impact Statement (FEIS) released last month. USDA could have maintained regulatory status over the perennial crop that is so important as forage for the livestock industry. Or they could have chosen a limited regulation strategy with bans on the planting of GE alfalfa seeds in seed growing regions to attempt to limit the contamination of alfalfa seed stock by foreign DNA from Monsanto’s crop (alfalfa is pollinated by bees and other insects and has a pollination radius of five miles). Instead, the agency, under heavy pressure from the biotech sector, chose total deregulation. Over 250,000 public comments were received during the FEIS process, with the vast majority opposing deregulation. Vilsack did announce that the USDA would establish a second germ plasm/seed center for alfalfa in the state of Idaho to try and maintain GE-free strains of alfalfa. They currently operate such a facility in Prosser, WA. He said the FEIS process brought home two key points to USDA: choice and trust. The Center for Food Safety, supported by The Cornucopia Institute and others, has been embroiled in a court case fighting the release of GE-alfalfa. Cornucopia is a formal plaintiff in the case. The legal matter has been on hold while the USDA completed its court-ordered EIS. Opponents of GE-alfalfa may soon determine their “choice” and resume the legal battle. 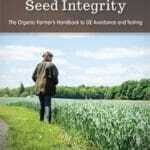 Genetic engineered crops, animals and food are banned in organic agriculture. Many conventional alfalfa and seed producers also have expressed their opposition to Monsanto’s new crop. Like organic producers, they do not want their strains of alfalfa contaminated by foreign DNA. Monsanto has aggressively pursued farmers for damages when they have discovered evidence of their patented DNA in their conventional crops. Planting of GE-alfalfa could begin this spring as Forage Genetics (owned by Land O’ Lakes) has millions of pounds of Monsanto’s seed in storage.